Lily had been confined to a crate for most of her life in an abusive home where the children would beat her, tease her and kick at her while in the crate. A Good Samaritan removed her from this situation, but she ended up at a high kill shelter in Kentucky where the management had a strong dislike for pit bulls. I learned that Lily had never actually shown aggression to anyone. She was just labeled aggressive because of her breed. I thought that was a sad story, but her story became more grim. After hours of talking with the volunteer and discussing the situation with my spouse, Matt, I couldn’t help but find myself staring at the most adorable face with giant ears I had ever seen. We finally decided to go for her. Something just felt right. The volunteer was thrilled and told us to call the pound immediately and leave a message for the warden with all of our information and make it very clear that we’d be adopting her so she wouldn’t be killed. After a sleepless night, because we were so scared that warden would disregard my message and Lily would be gone, we finally received word she was safe. The wonderful volunteers took her to the vet where she was fully vaccinated and boarded until we could have her sent to us. She is our little cuddle bug, by far the most loving, docile, kindhearted dog I have ever met. 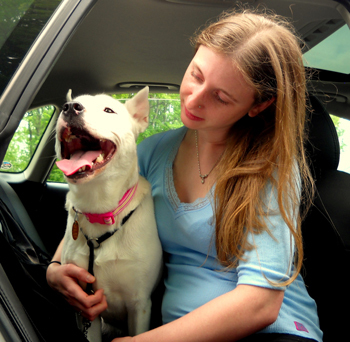 A week later she was on her way, aboard the first transport that these volunteers had driven to get their dogs to safety in the Northeast. As we drove to a pick-up spot to meet her, I recall the excitement and anticipation yet anxiety about meeting our new family member. I think I may have cried a little in fear that she might not like me! But then we arrived, and out of the van stepped the most adorable ear-full of pit bull I had ever seen. She insisted on greeting everyone there, human and dogs alike. We sat in the grass for a bit and got acquainted then decided to load up and head home. She hopped in the back seat and off we went. Just moments after getting back on the highway there suddenly was a little white pit bull creeping her way up front until finally landing with a plop right in to my lap and my face was being smothered in kisses. At that moment Matt and I just looked at each other and smiled. She was a good dog and we knew we had made the right decision. She was a good dog indeed. Back home, there was no tension when we introduced her to our other pups. They all hit it off well. Lily and our pointer mix, Itsy, became best of friends. We brought Lily everywhere with us. She was as happy as could be at any given moment and enjoyed everyone in her company. Lily will begin classes to become a therapy dog this month, and is also going for her Canine Good Citizen. 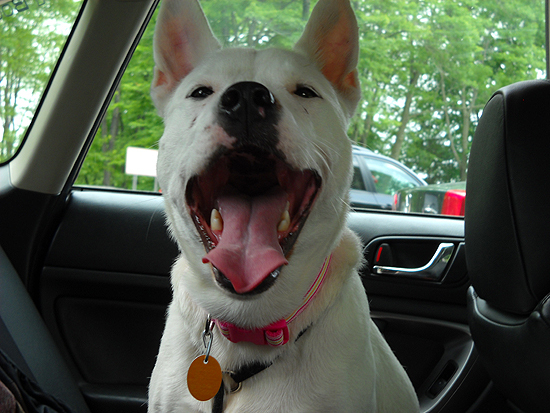 Lily also paved the way for us to bring more pit bulls into our lives. Dogs like Yam. Yam came into our lives just a few weeks ago. She’d been sentenced to death at the same shelter where we found Lily, after being found roaming wild — a feral dog with little hope of adoption. She was said to have been snappy with people and urinated when touched. But something, though I can’t put my finger on it, kept bringing me back her to her on Petfinder day after day. 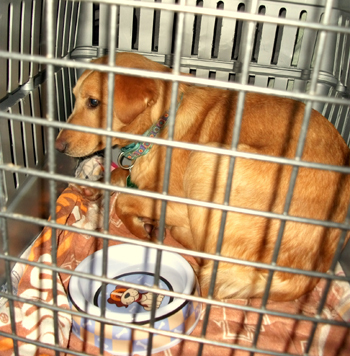 Once again, the wonderful volunteers got her to the vet and arranged for her to be transported to our home. When we picked her up, she was cowering in the back corner of her crate. She stayed just like that for a week. She wouldn’t even come out to go to the bathroom. I would spend hours each day hand feeding her, laying outside the crate and talking with her, but she just would not budge. She eventually began to come out when no one was in the room, but that’s as far as we got. They sniffed through the crate and I caught a glimpse of a little Yam tail wag. I began to notice her keeping a close eye on Lily, though, watching her with bright curious eyes. Yet when Itsy approached the crate Yam showed signs of fear aggression. Enough was enough. One way or another, this dog was coming out of that crate. One evening when the house got quiet, I put the other dogs in the bedroom and let just Lily in the room with Yam. I opened the crate door and after a moment of hesitation Yam was out. She left her safety zone. 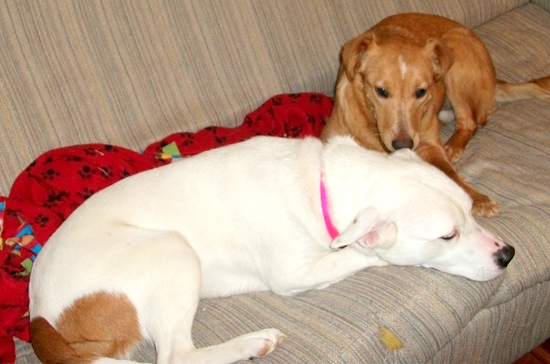 Lily approached her with a wagging tail and gave Yam a little kiss and then hopped up on the couch. This went on for hours and into the night. I couldn’t fall asleep because I was too happy. I knew then that Yam would be okay; she surely had a chance. Since that night, Yam has also warmed up to the other dogs in the pack and plays with them. She likes to cuddle up on the couch with me and she enjoys a good belly rub. She greets strangers at the door, has learned how to play ball – all things she has gathered from watching what Lily does. We still have a ways to go with her but with the help of our sweet Lily she’s on the path to becoming a happy, carefree and well-rounded pup. As always, another awesome story. I’m not sure what to say beyond that, as my wife and I aren’t dog owners yet and it’s hard to add anything to such an amazing write-up. The bottom line is: you all are doing incredible works with these dogs and it’s definitely been an inspiration to me to want to adopt ASAP! 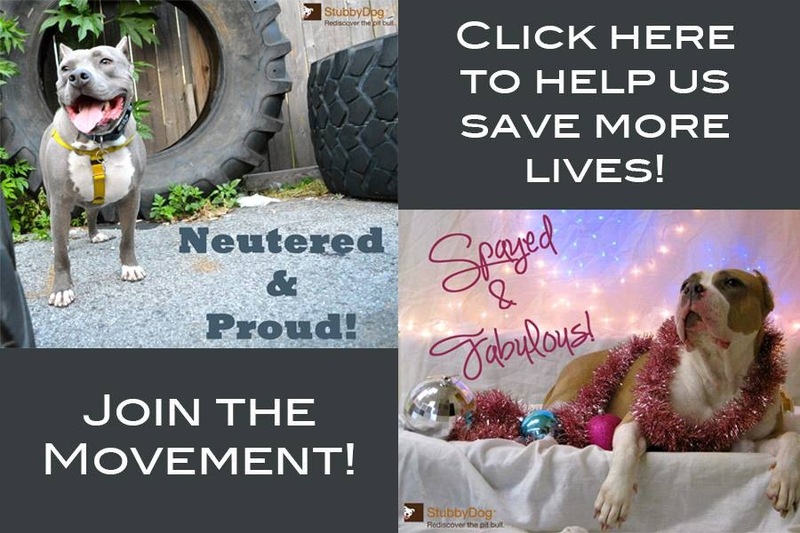 @JMattHicks Thanks so much for your comments, Jennifer and Matt really are incredible people who are really making a difference for these dogs. Thanks for your support and we hope you and your wife do adopt soon! how does yam get along now with itsy? i can’t believe how submissive lily is!!! @JenniferFarnum We sure will! 🙂 Thanks! This must be one of the best videos I have EVER seen. Knowing the back story on these two only makes it that much better. I could watch those pups play forever! I really warms my heart to see how the owners opened their hearts and homes to Lily and Yam with her special situation. WOW. @blazer That video is so special knowing that Yam hadn’t left her crate for a week. Jennifer and Matt are truly wonderful people that took a chance on dogs deemed ‘unadoptable’ and made a happy, loving household. Thanks for your comments.